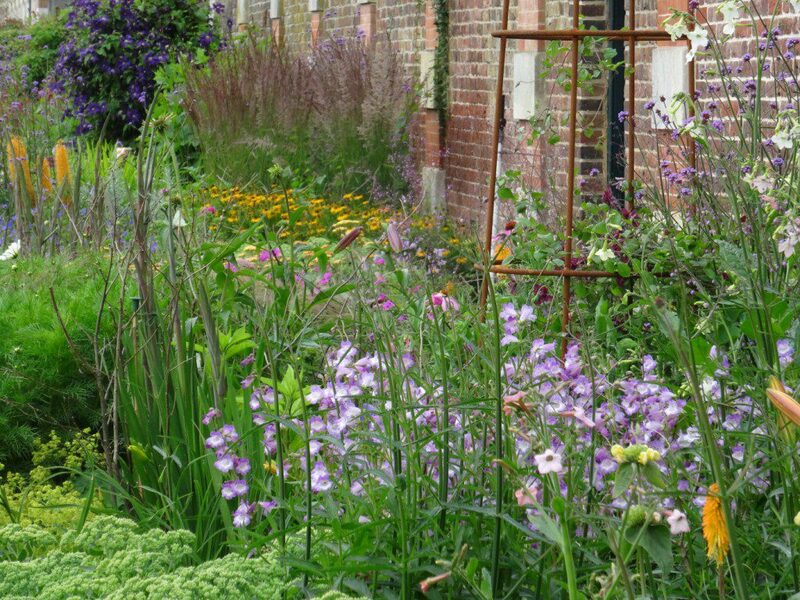 Herbaceous borders take a huge amount of work to keep them looking good, and because the East Front border is the longest in the United Kingdom, it is particularly time-consuming. I have worked on the section known as the Middle Border, which runs past the Real Tennis Courts, for the last 10 years, and it is certainly the part of my job which I enjoy the most. The lilac Penstemon ‘Alice Hindley’ is in flower and will remain so for the whole summer and right through October. The Gladiolus are yet to open, and the Sedum is still green, but there is plenty of colour and the promise of more to come. 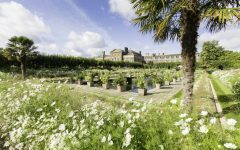 The Northern end of the border which runs from the Palace to the river has to be planted ‘in the spirit’ of Ernest Law, a historian who lived at Hampton Court and in the 1920’s designed a plan for this section. I am fortunate that, within reason, I can plant what I like with little intervention from anyone. 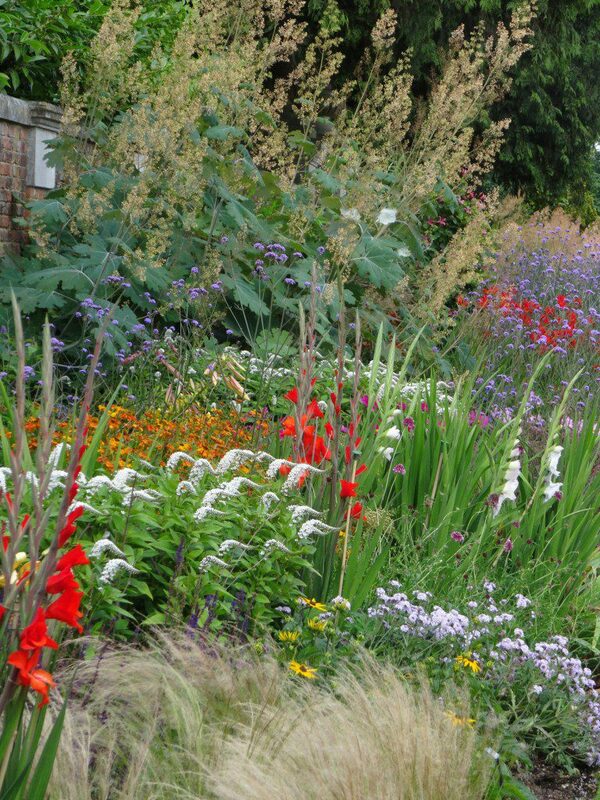 Although visitors do let me know when they like the planting, and equally when there are plants or combinations that they do not like. This photo was taken in mid-summer when most of the flowers are in their prime. The elegant swan flower heads of Lysimachia clethoides can be seen next to the rather bright jarring flowers of the Gladiolus. 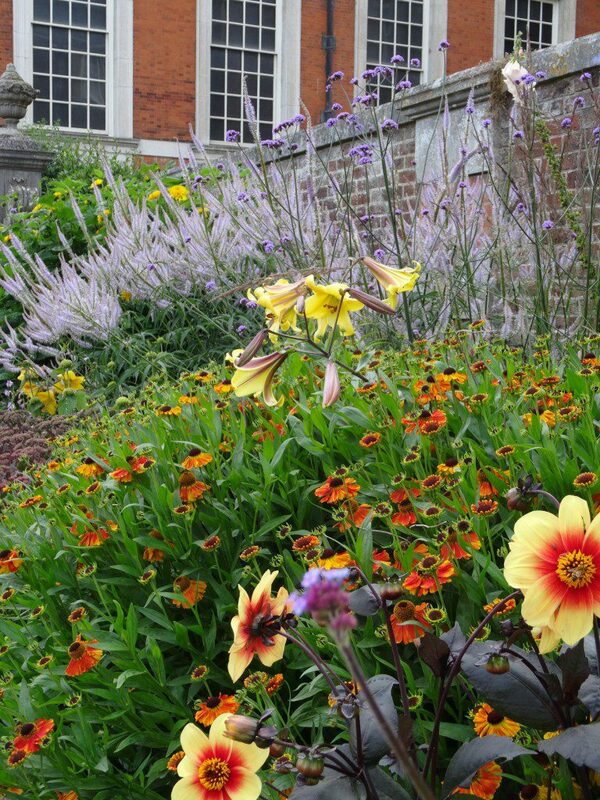 In a large border, the bright colour can be absorbed whereas in a small garden I think it would possibly be overpowering. At this time of the year, I review the pictures I have taken throughout the summer and decide upon the changes that I will make over the winter and in the new year. 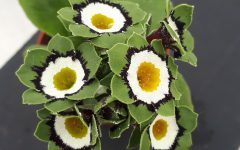 This will involve ordering new bulbs, changing some plant combinations and ordering some fresh bedding just to add a few easy reliable chunks of colour. However, the main task will be the rather unglamorous one of pinpointing the worst areas of perennial weed and doing our best over the winter to eradicate them. An impossible task, as it’s a rare year that I do not see the white trumpets of bindweed waving at me from the back of the border but each year we give it our best shot! Later in the summer, the beautiful bright flowers of Dahlia ‘Moonshine’ and Helenium ‘Waltraut are a nice contrast against the spires of Veronicastrum virginicum ‘Lavendelturn’. 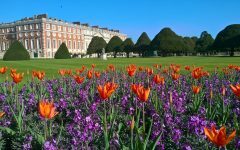 Be sure you come and visit Hampton Court Palace to see our gardens.